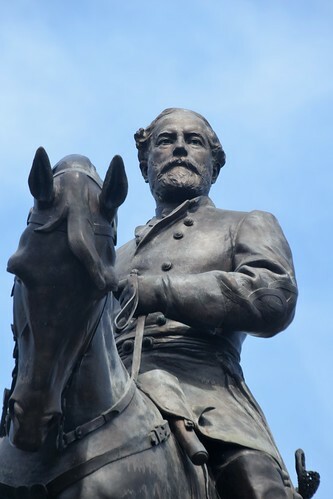 Robert E. Lee has been dead for 150 years, but the Identity Politics freaks can't leave him alone. The latest attack on Lee is by CounterPunch music writer Lee Ballinger reviewing a one-sided and utterly false book by John Reeves with the biased title of "The Lost Indictment of Robert E. Lee." The lost indictment of Robert E. Lee is the 1865 indictment of Lee, Jefferson Davis, Confederate generals James Longstreet, Jubal Early, Richard Ewell, and 32 others for treason by federal judge John C. Underwood, a vehemently and vengeful anti-South Reconstruction judge, who biased the grand jury with his denunciation of the indicted Southerners as men with "hands dripping with the blood of slaughtered innocents." Underwood's indictment was recognized as the worst form of political demagogy. The Commander of the Union Army General Ulysses S. Grant himself had the indictment quashed. But Reeves and Ballinger think that an indictment reflecting Underwood's personal hatred of the South is enough to remake Robert E. Lee from a white hat into a black hat. Ballinger concludes that it is obvious that Robert E. Lee was a traitor who deserved the gallows more than John Brown. "It was Robert E. Lee who put down the attempt of a real hero, John Brown, to incite a slave rebellion at Harper's Ferry, Virginia in 1859. Brown was found guilty of treason against the state of Virginia and hanged after a jury deliberated for all of 45 minutes. On the other hand, Lee was indicted for treason on June 7, 1865, but was never punished for it." Lee was a rich man "who owned or managed 200 slaves. According to former slave Wesley Norris, Lee frequently egged on his overseers as they whipped Lee's slaves." "Lee led a slaveholders rebellion that cost 800,000 lives." ... "Slavery (and slave owners) caused the Civil War." Let's take a look at these extraordinary charges: Lee is responsible for John Brown's death for treason, but got away with his own treason; Lee owned 200 slaves and encouraged their whippings; Lee was a traitor who led a slaveholders' rebellion. John Brown led an attempted uprising that seized the Federal Arsenal in Harpers Ferry, not Virginia's arsenal. Lee was a United States Military officer sent by U.S. President James Buchanan to suppress the uprising. Lee carried out the orders of the President of the United States. The Confederacy did not exist. The Army of Northern Virginia did not exist. Brown was tried by a jury and convicted. Lee was not a member of the jury. Lee's political indictment by a crazed Reconstruction judge was quashed by the leader of the Union Army to whom Lee had surrendered. Underwood's case against Lee was not considered by the U.S. government to be fit for trial. Lee was a U.S. military officer. He fought for the United States in Mexico and against Comanches and Apaches and served as Superintendent of the U.S. Military Academy. He spent his life in the U.S. Army, not running a plantation. He owned no plantation, much less 200 slaves. He took a two-year leave from the U.S. Army to settle his father-in-law's estate which required all slaves to be freed. Settling his father-in-law's estate was Lee's experience as a "plantation and slave owner." Lee led no rebellion. There was no slaveowners' rebellion. There was secession. Neither Reeves nor Ballinger comprehend that prior to Lincoln's war, residents of the states thought of themselves as citizens of the states, not as US citizens. Lee was opposed to the breakup of the Union and spoke against it. When offered Union command of the defense of Washington, Lee replied: "If I owned the four millions of slaves in the South I would sacrifice them all to the Union; but how can I draw my sword upon Virginia, my native state?" When it became clear that the North was going to invade the South, Lee resigned his U.S. Army commission and returned to his country -- Virginia. Reeves and Ballinger are so ignorant of the facts they they don't even know that Lee was not offered a Confederate field command until the second year of the war. Moreover, his field command was the Army of Northern Virginia. There was no civil war. A civil war is when two sides compete for control of the government. The Confederacy was a separate government. The war was the War of Northern Aggression. The South was an independent country formed on the same basis as the 13 English colonies, which had as much slavery as the Confederacy, formed the United States. Lee could not possibly be a traitor as he fought for his country. He fought, as all Southerners did, because they were invaded by Lincoln who was determined to hold on to the empire, just as the British were determined to hold on to their empire in North America. As President Lincoln said over and over, he invaded the South in order to "save the Union," not to free slaves. The South seceded because of the tariff, which had long been the contention between the North and South. The tariff exploited the South economically for the benefit of the North. Slavery was a states' rights issue. Lincoln said many times that he had no authority to abolish slavery. But tariffs were a federal issue. Lincoln said there was no need for war if the South just paid the tariff.